Going to Estates Court in a Brain Injury Case? Seriously? Located on the 7th floor of 361 University Avenue in downtown Toronto, the Estates Court is removed from the fast paced hustle and bustle of the ever busy Superior Court List across the street at 393 University Ave.
It’s not everyday a personal injury lawyer has to attend at Estates Court. There are a lot of differences between the Superior Court where motions in car accident cases are held, and the Estates Court. For starters, the Estates Court is gorgeous compared to the Courtrooms on the 6th floor at 393 University Avenue. Sorry Masters. There’s actually space for counsel to sit down. Lawyers aren’t piled up on top of one another in a cramped up, windowless courtroom. Lawyers are treated like cattle. Seriously. Don’t believe me? Come by 393 University Ave on the 6th floor and you tell me if it’s as cozy Courtroom you initially pictured in your mind. Did I mention there are no windows? I’d add a few other things which I love about the Estates Court, but I don’t want to put down our Superior Court in Toronto. It’s no secret that Toronto’s Superior Court list is very busy, and resources are scarce. I will leave it at that. If you’re more interested in hearing about the day to day problems of Toronto’s Superior Court, all you have to do is attend at Court one day and listen to what Judges and Masters have to say about it. Or you can read actual case law on the topic from the Honourable Justice Brown. Here’s a great read for all you starter legal eagles, who want to know what the Court system is all about and how it works. An excellent read even if you don’t understand the law. I got the feeling that this sort of thing didn’t happen at the Estates Court. There wasn’t even a line up to have my materials filed, or my Judgment issued and entered. Was I practicing law in St. Thomas Ontario, or was I in Toronto? I couldn’t believe it, but I digress. So, what was personal injury lawyer doing at the Estates Court before an Estates Judge on a car accident case for a brain injured client? Good question. My client was so injured that his psychiatrist deemed that he was not a capable or competent person. The psychiatrist found that he did not have capacity to manage his finances, or the activities of his daily life. Imagine that. You’re functioning completely normally and independently before a car accident. And then, because another driver made some stupid driving mistake, you’re now brain injured and your doctor has deems that you don’t have capacity to manage your own affairs. Sad. But, let’s get to the point of how the Estates Court comes in on a personal injury case. In some cases, the Court will require that a Guardian be appointed for the injured party to manage their finances and their self care needs. This is different than a Power of Attorney. It’s more than that. A Judge of the Estates Court is responsible for making a determination whether or not the injured party is incapacitated, and whether or not a guardian ought to be appointed. The Estates Court Judge will also determine whether or not the proposed guardian for the injured party is a suitable candidate. A Guardian can be anybody, but family certainly is best and has preference under the law. If a suitable Guardian can’t be found, then the Office of the Public Guardian and Trustee will assume that role; but they really don’t like doing that. The procedure of appointing a Guardian is called a Guardianship Application. They can be very complicated. They can be very messy. The Application materials need to be very detailed and include, amongst other things, a Management Plan and/or a Guardianship Plan. Large families may fight over who is the most suitable guardian. Incapacitated people with lots of assets which need to be managed adds further complication. So, when you see a personal injury lawyer in Estates Court, chances are that they’re there on a Guardianship Application for their catastrophically injured client. It’s not likely they’re arguing a will or over the distribution of the proceeds of an estate. Finally, welcome to the #GoldfingerSpeed Team to Troy Adams. 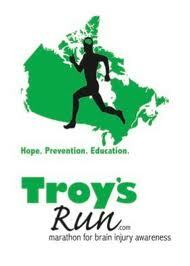 Troy is running across Canada a la Terry Fox in support of Brain Injury Awareness. Check out his page at www.troysrun.com. An inspirational story for accident victims across Canada. Well done. Go get em Troy!